House music lovers! 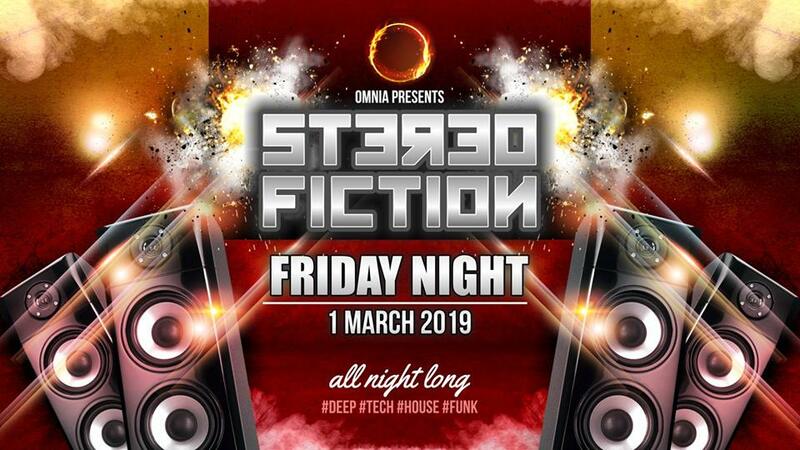 We are proud to announce that Stereo Fiction will be joining us again here at club Omnia in George. Join us for an unforgettable musical experience. This dynamic DJ duo have over a decade of musical knowledge and are expert artists in their own fields, whether it be Turntables, CDJ's or MIDI Controllers. Get ready for a solid 6 hour journey into the realms of House music; combining the enchanting sounds of Deep, Tech, Progressive and Funk keeping your ears captivated and your body grooving.... all night long. Some of STEREO FICTION'S "main appearances in JHB include clubs such as: TeknoTribe, Truth, E.S.P. and the Let’s Swing It events. Festivals include: Twilight, Vortex, Red Eye, Echo Gatherings in Western Cape, and most recently in the George Botanical gardens. Venue: OMNIA Entertainment 38 Courtenay Street, George.